HOURS: Until June 28- Saturdays & Sundays only 10AM-6PM. June 30-September 7- Tuesday-Sunday 10AM-6PM. 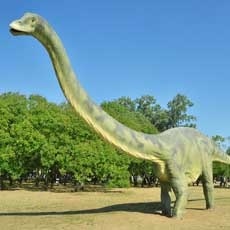 North America's premiere outdoor dinosaur exhibition. Thirty-two full-sized animatronic dinosaurs set against a dramatic natural setting in the New Jersey Meadowlands. Shows, games and a paleo-sing-a-long led by the world's only "Dinosaur Troubadour". A memorable family attraction sure to spark the imagination of every child.